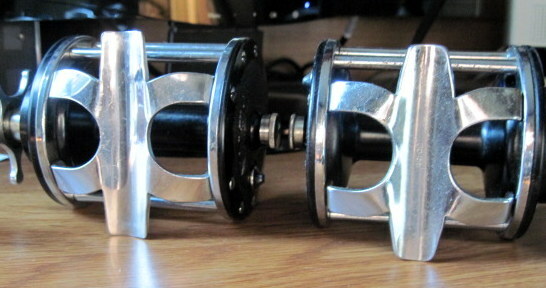 The knob on the reel on the left has sharper, more pointed ends than the one on the right. 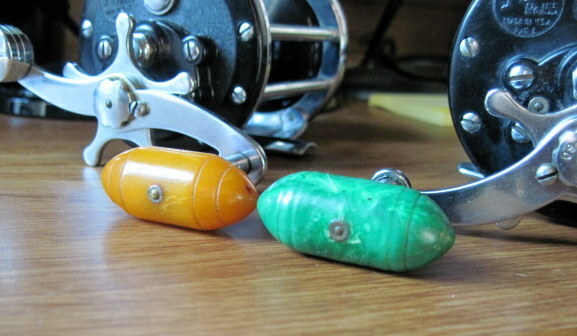 The amber color along with the shape indicates an earlier reel. And the design of the counterweight (three rings vs two) indicates a pre-50's reel. The "rounder" green handle would be at least the 1950's and later. The shape of the foot and the fact that the one on the left has no part number on it indicates the reel on the left is late 40's. Foot on the right with part number and tapered shape 1950's and later. 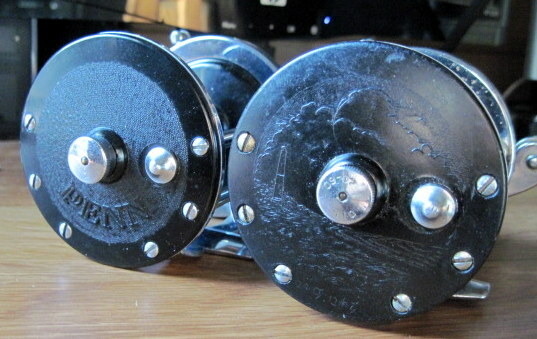 The stippled tailplate (and headplate) indicates an earlier reel when compared to a picture or smooth plate. And, the box type and price nail it for being a 1949 to 1950 reel. Without having a box to reference for the newer reel it is most likely a 1950's to early 1960's reel because of the picture on the tailplate rather than smooth.